The last two runners from the stable have won and we have three debut runners at two tracks on Friday. Zume Forward and Bill The Bee commence their career at Benalla and Touch A Could is under lights at Cranbourne. Zume Forward is the first to go in race one, the 2YO Maiden Plate (1106m) at Benalla with Patrick Moloney to ride. “She drawn lovely in two in a field of first starters bar one,” Moroney said. 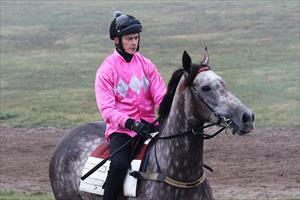 “Our filly has improved a lot this preparation and grown up a lot. “The way she works and her jumpouts show us she’s stronger, she’s got good gate speed and I’d be disappointed if she didn’t run a forward race. Bill The Bee is in race two, the second division of the 2YO Maiden Plate (1106m) with Patrick Moloney to ride. Like Zume Forward, Bill The Bee has progressed well this preparation and Moroney has a good opinion of the son of So You Think. “He’s a nice, scopey horse and has developed into a lovely sort,” Moroney said. “I’d like him to learn to settle and relax so ideally I wouldn’t want to see him bouncing and running here. Touch A Cloud is at Cranbourne and will be the first starter by Glass Harmonium that Moroney has trained, having prepared her sire to win at Group I level. Touch A Cloud (pictured) is in race two, the 3YO Fillies Maiden over 1300m where she will be ridden by Fred Kersley and jump from barrier three. “The field is reduced with scratchings and while she has good gate speed I wanted to start her off over slightly longer as I think she will get further,” Moroney said. “Her jumpouts have been satisfactory but the 800m tempo has not really suited her and I do think she will get out over further as we progress.